1982. I was in 6th grade at Southwestern Intermediate School in the middle of nowhere Virginia. Heat of the Moment was the number one song dominating the charts. Asia was huge already and everyone knew them. We were in some class and someone had a boom box with this song playing and one of my classmates, Kevin F., was playing along to the song on his desk. Kevin was a drummer. For as much as I was into music, I never really thought about playing an instrument until that day in class when I asked Kevin t show me what he was doing. Just as simple as that, he showed me what Carl Palmer was doing on the drums. I wanted to be a drummer. Right then. Boom. It took 2 more years before my parents actually bought me a drum set, but I finally got there. And thanks to Kevin taking 10 minutes to show me “how” to play something, a new chapter…a very important chapter of my life had begun. For all of the following school years after that, I constantly heard, “Sean, stop banging on your desk!” “Sean, stop tapping your feet!” “Sean, stop tapping those pencils!” and so on. The drums became a way of life for me between 1984 and 2000 when I was forced to give them up due to permanent hand injuries due to drumming. I loved playing the drums and still miss it every day. Fortunately I was able to pick up the bass in 2000 and able to continue on as a musician (yes, drummers are musicians too!). So basically it was because of Asia and Kevin that I ended up playing drums. Sure, something else probably would have happened to get me there, but that was, as I remember it, the catalyst. So…blame them! It’s also a big reason why the debut Asia album sits so very near and dear to my tiny black heart. It’s one of those albums that I can never grow tired of, no matter how many times I hear it. Their follow-up album, Alpha, wasn’t too bad either, but the debut is the one. 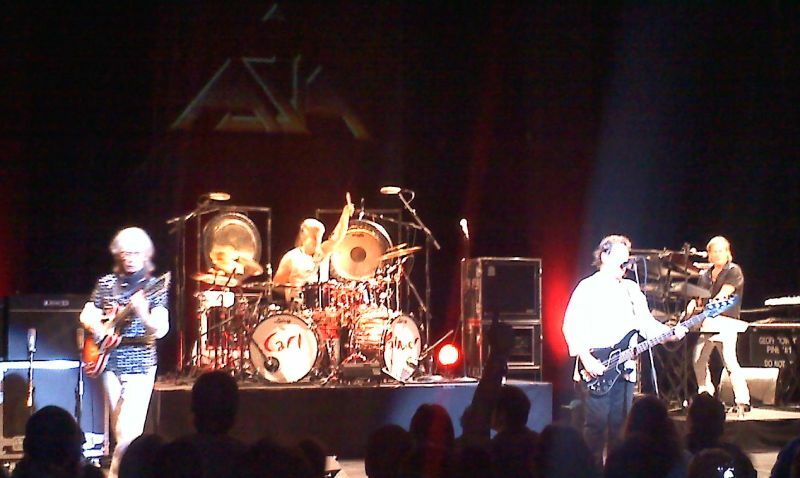 Being that I was also a YES fan, thanks to my older brother, it gave me an interest in Asia. Steve Howe is a great guitarist. 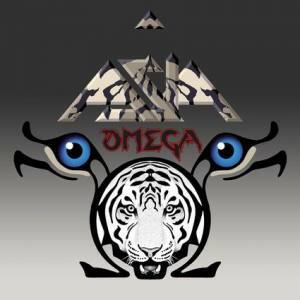 When I found out a month or so ago that Asia was coming here on their Omega Tour with the original lineup, there was almost no way that I could or would miss this show. I bought tix the instant they went on sale and ended up 7th row on the left side. My friend John ended up scoring front row on the same side the day before the show. Curses! Haha. But whatever. I was there and that’s all that mattered. The guy I play bass for, Doug Morrison, also wanted to go so I ended up getting 2 tix. The show was at the Paramount Theater here in Austin and I had only seen one other show there, Return to Forever, which was quite awesome in its own right. We get to the venue around 7ish and the band was slated to start at 7:45PM. We were both a little tired from playing a gig of our own the night before. I was checking out the merch and ended up buying the shirt for their current tour as it had the tour dates on the back. One thing I noticed after I bought it was that the band’s name was nowhere on the shirt. Odd. No biggie, I know what it is and that is all that matters. So finally the lights go down and they open up with I Believe from the Omega album. Everyone stands up to applaud them coming on stage and then we all sat for pretty much the remainder of the show. Kind of odd sitting at a rock show, but oh well. The Paramount is an old theater and the seats aren’t very comfortable, but we suffered through it. Asia plays songs from the debut, Astra, Phoenix and Omega. The overall sound mix wasn’t that great in my opinion. It may have been because we were 7 rows back from the mains on that one side, not sure. The drum mix got better though the night but his snare was still pretty quiet. Wetton’s bass was almost silent. I even put in earplugs to see if it would help but it didn’t. The band looked good. I mean these guys are all in their 60s now, so you don’t expect too much. Steve Howe looked like he was about 104 years old, almost like a combination of The Cryptkeeper and Dr Jim from Taxi combined. His playing was great. Nice to see those old fingers still doing those fast runs. He was solid as a rock. He wasn’t very animated but then again he never was. He was playing a double cutaway Gibson semi-hollowbody through 2 Line 6 amps. It was cool that the band took a break and he sat down and did an acoustic solo which included Ram, a great little acoustic number of his. John Wetton was playing an old black Gibson Victory bass through a 1×15 Ampeg combo amp. Like I said before, I never really heard much of what he was doing but saw some flashes of his talent in the runs that he was playing in a few tracks. I liked that he rarely looked at the bass, he knew what to do and where. He was, however, using a teleprompter and relied on it quite often. I’m not the biggest fan of those things in general, but hey, I guess he’s gotta do what he’s gotta do. His voice was stellar. I don’t think they tuned down at all and he was hitting almost every high note with relative ease for a 60-something year old dude. Geoff Downes really looks the same as he always has, just a little chubbier (I feel his pain!). He had the usual 3 stacks of keyboards surrounding him and his playing was fine. He also handled all of the backing vocals. Some were synthed but most were raw and he sounded great. He’s a fine keyboardist. Finally…Carl Palmer. In general I’ve never really paid attention to him as a drummer other than what he did on the first album to inspire. It surely wasn’t because of his “badassedness”. My opinion of his playing changed a bit last night. Even as a drummer, I usually didn’t care much for drum solos. I never did them in bands I was in and most of the time would get bored seeing them by other bands. There were always a few exceptions. Carl Palmer became one of those exceptions. His solo was tasteful and entertaining. He did a lot of jazz stuff, which is what I prefer to see in drum solos. Super fast quads and triplets and blistering double bass is just so cliché. Carl played traditional grip on his left hand the whole night and during his solo he threw in some cool Buddy Rich licks, both aurally and visually. It was pretty cool. The dude has some chops. I just wish the drums were mixed a bit better. But…nice work, Carl. By the way, Carl looks like Richard Mulligan from the TV show “Soap”. Pretty funny. One thing I noticed was the interaction (or lack thereof) of the band members. I’d see Wetton and Downes make eye contact a few times and I’d see Palmer and Downes smile at each other a bit. But there was no eye contact between Howe and Wetton, not even once. I sensed a little animosity. It may also be because Howe seems like he is blind nowadays. He was wearing some thick glasses. We found out before the show that there was a no camera policy for this night. No biggie. People were still snapping shots with their camera phones (me included). By the last 2 songs, everyone seemed to be taking pictures and Howe seemed pretty annoyed by it. He made some funny faces to a few folks who got up and walked to the stage to take pictures and actually took one guy’s camera and acted like he was taking pics of the crowd. People were laughing but I don’t think Steve was doing it to be funny at all. I was also surprised that the show didn’t sell out. The venue isn’t that big and there were several empty seats. Overall the show was better than I had expected. The band took a 15 minute break mid-set and the whole show was over at 9:45PM. I was very glad that I went and it was worth the ticket price for sure. So…Thanks Kevin. Thanks Asia. A very nice concert review. ASIA is a timeless band… that debut album could have been released for the first time last year for it was so ahead of it’s time. IMO. I never can understand the policies surrounding picture taking at concerts. You would think that by now, the members of ASIA would not give a junk about that sort of thing… life is too short. The majority of fans just want the memories of a great band and concert to visually look at. Oh well. Was there ever a chant for an encore performance of “Video Killed The Radio Star”? (Just Kidding). Again… as usual… great personal experience you’ve shared.